Eagerly looking forward to the start of the spring season, attendees in Providence trickled in steadily for the weekend start of the Rhode Island Spring Flower & Garden Show. Being held at the cavernously urban space of a warehouse at the Rhode Island Convention Center, I also wanted to see the colorful preview that spring flowers can bring. After a casual visual tour, many vendors set up shop selling various types of artisan gifts and crafty items, such as earrings, garden tools, chocolate fudge, dipping sauces, books, grilltops, soups and nail care. But flowers are the only item that seem to be in short supply. Wait a minute, they claim to be “New England’s Premiere Flower Show”, but where are the flowers? 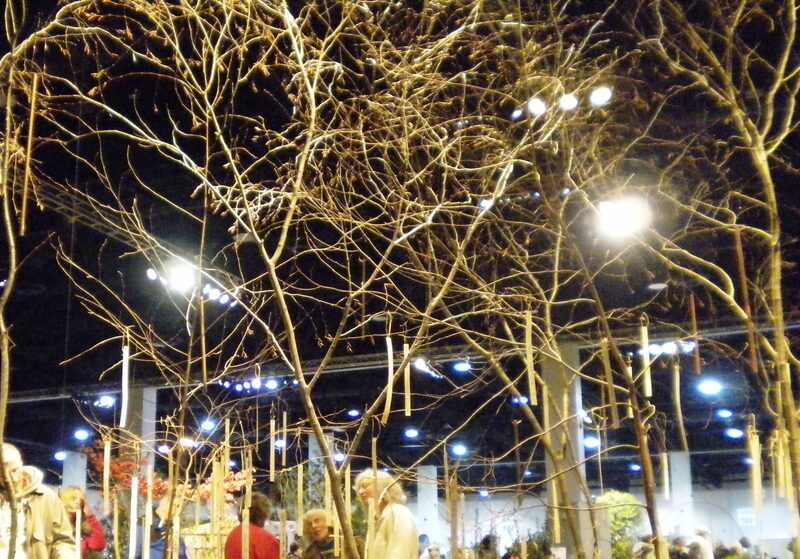 The large exhibition floor was divided into two sections: one for vendors selling crafts and various wares, and the other devoted to scenic displays of gardenscapes and landscape design. The few flowers that were seen seem to be last-minute accents dotted along the displays and several cheery sunflowers that were painted by an artist. Most of the visitors there consisted of seniors, judging from the ticket sales. But it looked like they turned in a worthwhile visit getting ideas and inspiration with purchases of garden tools and picking up business cards for sandsculpturing services. That is, if your idea of spring is getting into a tropical mix of jungle foliage with an exotic waterfall. However those looking for botanical garden bliss won’t find it here. Beautiful photos, but I can see your point. If you want some flowers, you could always vist my blog, Paul. Wait, why were there so few flowers? Harsh winter? Too cold to ship them? There is a bigger competing flower show just nearby in Boston, so I think all the exhibitors show there instead. This one is probably not as respected or well-attended as Boston, but the RI event happens just a month before Boston’s. It acts as the unofficial preview for folks looking for gardening ideas.